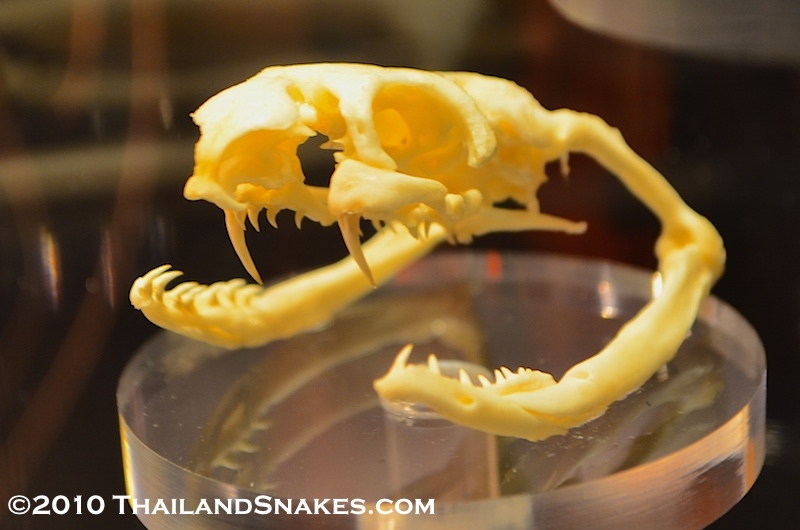 Naja Kaouthia – Venomous – VERY dangerous and very common Thailand snake. The monocled cobra is one of Thailand’s most deadly snakes – with highly toxic (neurotoxic + cytotoxic) venom. One bite on your toe from one that jumps out from under your outdoor refrigerator can kill you. I heard the story direct from a woman which had this happen to her husband. Monocled Cobras are nearly everywhere across Thailand. I had a friend that found them in his kitchen often. 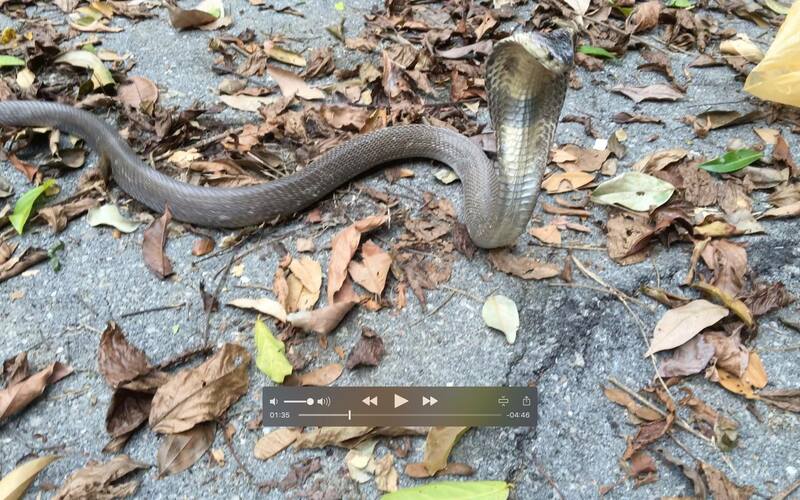 I’ve seen them crossing the road (see video below), and there was a family of these cobras living under the office of my wife’s workplace – with many 18″ baby cobras. I just heard about Grant Thompson, an 18-year-old man in Austin, Texas who was bitten on the wrist by a monocled cobra and died of cardiac arrest. Authorities are looking for the snake. Tips that might catch the snake 1. If cool in the mornings, the snake might be found in bushes sunning itself. These cobras prefer hot weather over 80°F. 2. They are most active during daytime, but can move at night. 3. N kaouthia will eat eggs, mice, rats, if no other snakes are to be found. They prefer snakes, but I don’t know what Grant fed his snake. It might be unable to stalk prey and feed itself and die within a month. Releasing a monocled cobra at a mountain location after it was found in a populated area of a village in Thailand. Screengrab from one of my videos. ©2015 ThailandSnakes.com. Thais respect (fear) this snake because many have friends or relatives that have been envenomated (bitten and venom injected) by this snake. They even make Buddhist amulets with cobra snake images. I’ve worked with two hatchling monocled cobras, and even at 12-15 inches – they are fierce. One snake handler described monocled cobras as “spastic” – and I have to agree. If you are bitten by any cobra – get to the hospital as fast as you can. 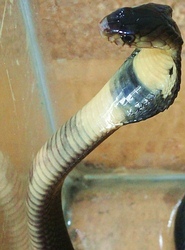 Monocled cobra venom is on par or even more toxic than some of the Thailand kraits, and much more toxic than King Cobra venom when compared drop to drop. Even if the bite is a small one, a nick, or a scrape, get to the hospital immediately. All it takes is a drop of venom to hit your blood stream for biological chaos to ensue. Appearance: Monocled cobras are easily identified by looking at the back of the hood – there is a monocle – or eye type shape there. They are light brown to dark grey to solid black. Most are very close to black. Length: Typical maximum length about 1.5 meters. Recently I saw one in a mangrove forest that was 2 meters long, a giant. They can get up to 2.2 meters – about 7.5 feet long. Range: All over Thailand and most of Southeast Asia. Notes: Neuro toxic venom affecting nerves, brain, and causing death very quickly without treatment. They are very fast strikers. The baby monocled cobras are every bit as deadly. Please be CAREFUL! Recently a friend and I found a 1.5 meter long N. kaouthia on a dirt road near where we were herping. It was nearly paralyzed but gaped its mouth when touched on the head with a snake hook. The body didn’t move. We think it was just bitten by either a krait, or a King Cobra – both of which prey on this species. There was one visible bite mark on the side of the body and nothing else. I’m guessing King Cobra. Habitat: Both flat and hilly regions. I’ve seen them on hills, but usually near people – under houses and in places rats and frogs are likely to be found. I’ve seen them most often in residential areas bordering forest, or near the ocean. In the mornings they can be in trees and bushes – trying to get some sun to warm up. They love to hide under leaves, wood, anything really. Lifespan is around 30 years. Active Time? The snake is mainly diurnal – active by day, but I have seen a number of them still active at night. In fact, in Thailand – I’ve seen about a dozen active at night – the rest were active during daytime. Food: Rodents, lizards, frogs, birds, eggs, other snakes. Defensive Behavior: Lift head off ground and flatten out neck. The hood flares quite wide compared to the width of the body. 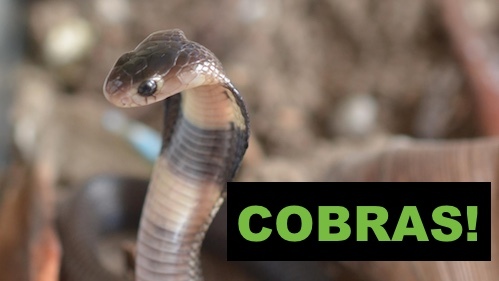 When comparing the monocled cobra and the king cobra, the monocled cobras have a hood flare that is more extreme in relation to the width of their body and heads. They can hiss when they strike. Monocled cobras are very active and ready to strike especially as the temperature climbs past 35°C (about 95°F). Do be very careful with them during this temperature range because they are very easily agitated and strike much more often. Skull from adult Monocled Cobra shows medium length, strong fangs. Photo from Queen Saovabha Memorial Institute in Bangkok, Thailand. Venom Toxicity: Very toxic, deadly. Even a small bite can kill you. See “neurotoxic and necrotoxic / cytotoxic venoms” (link). Offspring: Lays 25-40 eggs. Young are fully prepared to envenomate as they hatch. Mating takes place after the rainy season. Eggs incubate in about 2 months. Eggs hatch between April-June. Hatchlings are between 8 to 12 inches at birth. Save 50% if you order before April 15! Hello,I’ve got a question.One day my girlfriend and I went to get a massage,while we was there we saw a snake next to the curb..I have been looking for this snake everywhere..i think it was a cobra,she being thai said it wasnt.So let me tell u about it..It was a silverish copper color with two black markings one each side,the marking was a little behind the eye.Could u help me identify what snake this was? I wish I could tell you… there are many factors that come into play… Where in the country are you? Were you next to the ocean? How long was it? How thick? There are way over 100 different species of snake in TH – many of them silver/copperish. Many with markings behind the eye… Best to treat it like a cobra though! I’m still clueless. Maybe a rat snake. Maybe a cobra. Maybe a kukri snake. Maybe a keelback. Maybe a snail eating snake. Maybe a water snake. Maybe none of those! Too hard to guess really! 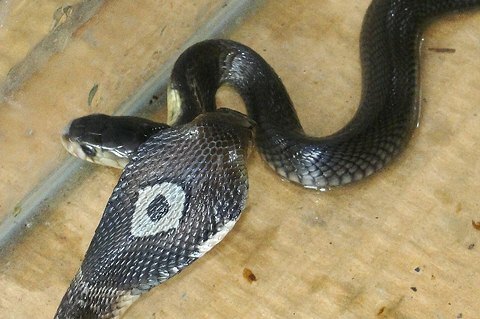 Im an snake expert from malaysia i have got 6 king cobra’s in my basement as pets! the generation today has an wrong understanding on snakes. but the truth is if you handle this snakes with care and respect the snakes will be your pet.otherwise they can be as deadly as a bullet it the brain. I’m not among snake experts. But I think that might be Spectacled Cobra. I’m Stan, I’m an exotic non venomous snake and chelonian keeper. I’m very interested in the venom of the Cape Cobra Naja nivea and the Thai Monoculate or Monocled Cobra Naja kaouthia and would like to know more about these species of venomous snakes which I know are from Southeast Asia and India. Hi. I’m in Nakhon Sawan and we are finding lots of these snakes lately. We have quite a few dogs who are regularly left in a free leash area. Last night one of them killed a Monocled Cobra. I am now very concerned about leaving my dogs in this area. Is there anything we can spray or do to prevent these snakes entering the area? Not unless you want to poison the environment. I suggest getting some traps with glue on the bottom. You can buy them on Ebay if you can’t find them in Thailand. I’ve never found them here. The glue traps a crawling snake, then the glue is dissolved by vegetable oil or something else when you want to let the snake free elsewhere. Put the traps where you see the snakes. If you find a dead snake you can scent the boxes by rubbing it on there. Monocled cobras eat other snakes and will smell it and investigate. Other than that, there’s not much you can do. Where monocled cobras are, sometimes there are a bunch of them. Vern, thanks for the tip re: glue traps. I would prefer to do that since I don’t want to harm the snakes themselves. I’ll give it a try. Hello Vern, I’ve just read your very informative and interesting article on the monocled cobra. It reminded me of an incident when I was a child in Singapore nearly sixty years ago. As an army family we were posted to Singapore for three years. One lunch time my mother and amah were in the kitchen preparing lunch. My Mum had her eye drawn to the rubbish pedal bin by the open kitchen door; leading to the back garden. She wondered why the belt of her favourite black dress was draped across the bin. Suddenly the belt began to move. She tried to scream but couldn’t. The amah saw it and screamed. By chance my Dad was home that day and rushed into the kitchen and kicked the bin out of the back door. He followed it out and was confronted with an enraged snake. I appeared on the scene and saw a black cobra advancing and hissing loudly at him. Fortunately the gardener have left a hoe resting against the door frame. Dad picked it up and commenced chopping. He pushed me back as I saw the front portion of the snake advancing as dad had cut it in two. Being into snakes I told my Dad that it was a deadly monocoled cobra and that its mate would come looking for it. He did not believe me. However, when the gardener turned up, attracted by the commotion and verified my statement. I can see my poor Dad now: he sat down and all the colour drained from his face. We were lucky we never saw the mate and apart from everyone else I had a two year old brother who would never had reached the hospital alive if we even knew he was cobra bitten. The joys of an English family in the Orient? Saw one of these on Lanta today. Very calm, even though I had to move it/get it to move by gently pushing it with a broom. Never got aggressive, but was eventually killed due to where it was found (a lot of people working there and a lot of loot to hide in). That’s really sad… Kittens are curious. I wonder if they may have found a pit viper, and started to play with it. The Malayan pit viper venom is extremely strong, but how long were you gone? Were the kittens bleeding from any orifice? That’s a major symptom of this snake. A cobra’s venom, a krait, would be strong enough to kill very quickly – possibly minutes. Kittens are probably too big for the krait or the viper, and most cobras. Kittens are generally eaten by bigger snakes – like pythons, but they have many teeth and no venom that would cause death. Quite hard to guess what happened. I cannot think of another animal that might have caused the kittens’ death though. Probably a snake with venom. Was there climbing required for a snake to reach the kittens? What time did you leave and when came back? Sorry to hear of this unfortunate incident! Hi Vern, your response was really helpful. In the end I decided it was wild dogs as they were getting into our compound. Saw them eating another pregnant female cat who had been killed. Not sure if I was correct but they were coming around a lot at night hunting the cats. I think I came face to face with this dude (monocled cobra) a couple of days back though. He/she came out of the drain while I was having a morning coffee (10am) and as I was very still messaging on my phone neither of us realised we had company until I looked up!!! We were only a couple of meters apart. Luckily we were both as perturbed as one another and it disappeared quickly. It was about a meter long and around 3-4cms diameter. I’m pretty sure it was this snake. It was black in colour and I could see a slight light brown edge and broadening where the hood would be. I didn’t see the moncled eye clearly though as we both moved away quickly. Do you think it was this snake? They’ve just recently started building work a few doors down recently with a lot of vibration on the ground around where my neighbour found a nest of baby snakes when he was burying a cat. My main concern is I have a young child now and I still want to be able to use the yard with her Planting vegetables etc. I have been looking at lots of ideas to protect our space and a fence seems the only option. I’m trying to work out the best material and thought with your experience you could offer some advice. Do you think this type of material if anchored in the ground (no gaps) to about 36 inches high would work? I’d stake it with metal poles. Or would this be better. I am worried about a snake being able to climb up and also spit. I know both are probably unlikely but I have to consider the worst. I am thinking the first option above is better as would have movement / flexible so harder for a snake to attach itself to. There’s no good answer for what you want. I think people need to adjust their expectations of what they can do in their own backyard. I certainly wouldn’t have my daughter play in grass in the yard in the day or night. Just not worth the risk. You cannot keep out all snakes. Likewise thanks for the great info – very handy. It has been very hot and dry here in Udon Thani for the last 3 weeks, and I was out with the dog (yes, strange here in Thailand!) along the stream and he crossed over the dried bed where he normally would not have been and disturbed a monocled cobra which naturally rose up to meet his aggressor; the dog had already killed another snake but I was caught on the other bank trying to call him to get away, whilst also trying in vain to get the phone video going (!). My labrador made two or three attempts to go for the cobra before the snake decided to turn tail and slithered hastily along a puddle of water to escape. It was about 1.25m in length I would guess. For sure I am now a little more wary when out along the stream! Only hot and dry for 3 weeks huh? We’re going on 4 months! Yeah, the monocled cobras are one of the most dangerous for dogs and cats. Still, some dogs seem to be able to dispose of them rather quickly. Scary to watch your dog near one though. The venom would kill it very quickly. 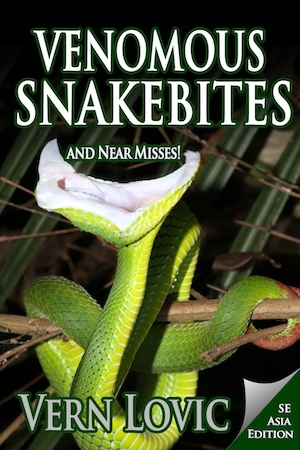 Be careful of the spitting cobras… I think you get them up your way too (Naja siamensis). Cheers! Yep these snakes are everywhere. We live near the pata department store and our garden boarders a big area of wasteland that somehow didn’t manage to get developed, as the other condos sprang up around it. One day we noticed our bulldog rolling around on what turned out to be a baby monocled cobra. He squashed the thing flat and luckily wasn’t bitten. Over the next two months we had another 10 of them come into our garden. Each time we called the local pest control who managed to capture them. That was almost 3 years ago and we haven’t seen any since. Our daughter was extremely lucky as one poped out under the fridge when she had gone to get a drink. Sirirat hospital is only 10 minutes from our house but I always wondered how poisonous these snakes were. Would we make it in time? I checked with the hospital and they hold me that they had antivenom there. Scary, but luckily we haven’t seen any for a while, so hopefully the 10 we caught put a stop to them producing more offspring. For a child bitten by a monocled cobra – any cobra or krait – time is SO critical. Wrap the limb and get to the hospital ASAP. I have a book and some videos coming out shortly that will help. Cheers! I love this site, I had a very close call with a snake last September at the Centara in Karon, Phuket. We were staying in one of the cabanas that has a small walled garden out front with a private plunge pool and patio and a trellis above. It was on our last day at about 9am I’d gone out onto the patio and was hanging out a couple of shirts on the sun lounger to dry. As I stood up a snake dropped down from the trellis above and landed on the sun lounger. It was very black but with a small mark to the back of the head, about 18″ long and fairly thin. I’ve been to snake shows in Ao Nang & Phuket and this snake was much thinner than any of the Cobras I’d seen there but admittedly not as long either. Anyway the snake moved very quickly under the gate. I told the concierge at the hotel but he didn’t seem that concerned. Was it likely to have been a cobra ? I go to Thailand a couple of times a year mostly to Ao Nang & was wondering what time of year sees an increase in snake activity ? I’m from South Africa currently in Thailand on vacation with my wife. Your sight is very informative and may just help in case we come accros a snake here. I also are intrigued by snakes and will rather evade them than kill them. I find it very interesting that older people back home also believe that snakes live in pairs which obviously is not true. However there must be some truth about this believe as people over the world believe this. I think snakes follow other snakes by sent and not because they live together but rather because of mating or eating habits. Hope someone knowledgeable in this field can maybe tell us more about this subject. I have very rarely seen two snakes together in the wild… only after hatching or during mating season. I heard that these gúy can spit the venom but not too far, is it true?